Are you religious with your night cream? Deborah Tan admits she isn’t … but … she may just have found The One in Origins’ new High Potency Night-A-Mins. I think I have found THE night cream of my dreams. Night creams are tricky business for me because I often find them too rich for my skin. For those who don’t sleep in air-conditioned rooms, you may find using night creams – which tend to have a richer consistency than their Day sisters – result in you waking up to a thin film of oil on your face. I could use a night cream with a less rich texture, but often, these feel inadequate and not soothing enough. I’m at the age where I want my night cream to be everything without being oily. I want my night cream to (1) have lots of skin-loving benefits (2) have a relaxing scent and (3) be able to give my skin a nice, rested glow in the morning. When Origins High Potency Night-A-Mins arrived at my desk about a month and a half ago, I couldn’t wait to get home to try it. Night creams often have more potent, richer ingredients because our skin’s temperature and metabolic rate are at their highest at night. As a result, we lose more moisture and produce more free radicals. Night-A-Mins is a mineral- and vitamins-packed cream formulated with a blend of skin-fortifying antioxidants that’ll help strengthen the skin at night so it’ll be better able to protect itself during the day. It is oil-free yet it plumps up skin with hydration with ingredients that replenish its moisture reserves. The minerals and vitamins that can be found in Night-A-Mins include Salicylic Acid (to help slough away surface dead skin cells), Fennel Seed (to tighten skin), Vitamin C (to fight free radicals), Vitamin H (to promote overall skin health), Calcium (to seal in moisture and defend skin against future dehydration), and Magnesium (to soothe dry skin). The ingredients may be what make Night-A-Mins a highly effective night cream but it is its scent that won me over. It contains an essential oil blend of neroli, which promotes tranquility, valerian, to relieve nervous tension, orange, which conveys positive feelings and happiness, and vanilla, known to relax and soothe irritability. I love the scent and it is to this delicious cloud of sweet dream-inducing fragrance that I look forward to at the end of every day. Suddenly, bedtime is an event that I look forward to! On weekends, I even use this cream as a day moisturizer so I’ll feel more relaxed and calm! In fact, it was found in an Actigraph study (an actigraph is a “wristwatch” device that measures how many tosses and turns you do while you sleep) that almost all panelists experienced a more restful night with longer, more tranquil sleep when they applied Night-A-Mins before bed. For your best night of sleep … ever! Dole out a pearl-sized dollop of Night-A-Mins after cleansing and treating your skin. Gently warm the cream – this will help your skin absorb it better and release its relaxing scent – by rubbing your hands together BRIEFLY and then press it firmly into the skin on your face and neck. Massage the cream into your skin with soft upward motions. Then cup your hands around your nose and inhale deeply to experience the scent. I’ve been using Night-A-Mins for close to two months now and I’m glad to report that I have stuck to it. The gel-cream texture doesn’t grease up the face and it allows those with oily skins to enjoy the rich, skin-repairing benefits of a high potency night cream. The scent makes this cream a joy to use. I notice how my cheeks look rosier and healthier in the mornings while the skin at my forehead and night look smoother and softer. There is little noticeable improvement in lift and firmness, but these you can remedy with a weekly use of skin firming mask or a dose of anti-ageing serum before using this night cream. I’d recommend Night-A-Mins for women who want to use high potency night creams but have not been able to find out suitable for use in non air-conditioned rooms and for our humid weather. 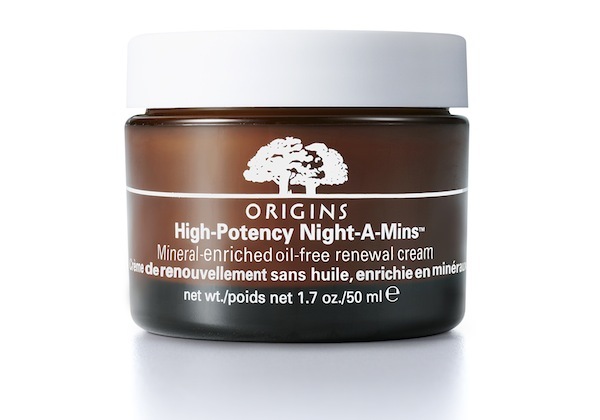 Origins High Potency Night-A-Mins Mineral-enriched oil-free renewal cream retails at $55 for a 50ml jar at TANGS Vivocity, Robinsons Orchard, Robinsons JEM, Robinsons Raffles City, Isetan Scotts and Metro Paragon. Night-A-Mins was given to Material World for review purposes. All opinions are the author’s own. This post was neither paid for nor advised by Origins in any way. You may read our advertising policy here. About The Author: Deborah Tan is a founder of Material World. After 10 years of working in magazines Cleo and Cosmopolitan Singapore, she is now a freelance writer/editor who works on this website full-time. She likes liquid eyeliners, bright red lipsticks, tattoos, rock & roll, Mad Men, and Suits. She believes she’s addicted to the soothing scent of lavender. Follow her on Twitter @DebTanTweets.